I'm thinking of getting some more Tupperware and dividing it all up but it doesn't look as god as wooden boxes. I'd also like to ahev different shelves for the year I saved the seed as well. Lester has 'borrowed' a draw in the office area. I flinch at his lack of organisation. I keep my seed packets upright, in neat rows in old seed trays. He doesn't. He has a heap! Mine is a heap at the moment but divided into families and the groups I plant in - it makes sense to me! I do want to be more organised though. Buying seeds is a bit of an addiction for me. I have large coffee cans with the plastic lid, I put the year of collection on top and just put the seeds in there, larger seeds like bags of beans have their own bags. Some seeds last for years so I sometimes plant older ones if a crop fails one year. 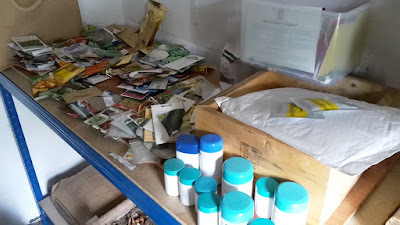 I think to try and save seeds every year would be impossible, I think to concentrate on a few and do them well is much better. Brassicas keep for years for example whereas parsnips and carrots aren't so good. I use an old narrow drawer that I picked up from a car boot sale from an old chap selling tools, he was amazed I wanted the drawer they were in and not the tools themselves. I made dividers for it from old foolscap filing cabinet files so that all the seeds are in their own categories. Opened packs get put back in but are always used up first. No it's good, that's the type of thing I was thinking of making to sell really out of reclaimed wood. I use an empty Swimming Pool chemicals pot; it's an absolute mess, and filled with long out of date seed packs! Some of the dates on mine are terrible that's why I was having a sort out. There is a squash packet in there from 1998! I have two boxes, one for flowers and one for veg/herbs ect. I like your idea to make for yourself and then make some to sell on. I will watch to see what you design. I'd love to make more garden stuff, io think it's important that these things are made by people that use them. i use eight 4 litre shoe boxes and put sames with sames in plastic baggies and/or things that get started at the same time. kev - if you have a bunch of old seeds that you don't plan on planting - this a good time to start sprouting your old seeds. almost any kind of seed can be sprouted (the only one i know that you can't sprout and eat is beans) - just check if your type of seed can be sprouted to be used as sprouts to eat. brassicas, lentils, chickpeas, corn, alfalfa, etc. - are all delicious in salads, soups, sandwiches - or just a big handful of them on their own. Kev, you are really good at thinking up ways to make things to fit a need. You would prosper here, because I am sure you could come up with all sorts of ways to store guns, ammo, powder, reloading tools and supplies. I'd be a good customer, my reloading room looks like a band of drunken monkeys went through it. Kymber - I kepp thinking of sprouting seeds but never get round to it. I was going to move the chickens about then sow over their old plot with lots of seeds so when I get new hens they have something to dig in. Harry - Gun and ammo storage over here is normally only in a lockable police approved case. I'd love to make soemthign for the supplies though. I find making storage solutions really interesting. Thanks! I'll have to get my thinking hat on! And I thought I had a lot! You do have a good collection going. I planted a number of things yesterday but I have more planting to do today if the weather cooperates.